Where on earth has this last year gone? Christmas present time again. All of a sudden I realised that I hadn’t even thought about doing my ‘wish list’, or about buying presents for my friends and family. And now it’s almost December, and it is amazing how many items I have just been looking at say ‘Sold Out’. So this next bit of writing is a mixture of “What I’d like if I could afford it, but can’t,” and the next bit is “What to buy for others” and then “What I can’t do without.” Also, being the proud owner of a fantastic new kitchen, cupboards already straining and overflowing with my huge amount of cookware collected over the years of being in the business, dare I say that I would love some more! Hope Erik doesn’t read this post, or I’m in trouble. First of all, the calendar I can’t do without – Emma Bridgewater’s husband, the very talented Matthew Rice, has created and illustrated a calendar for quite a number of years, and both myself and my family love them. Not only has it plenty of space to write details of special birthdays or appointments, but it is a pleasure to look at, funny at times and Matthew gives you loads of information on growing your own, recipes or how to look after your chickens etc. Have a look at this year’s calendar, from Emma Bridgewater. 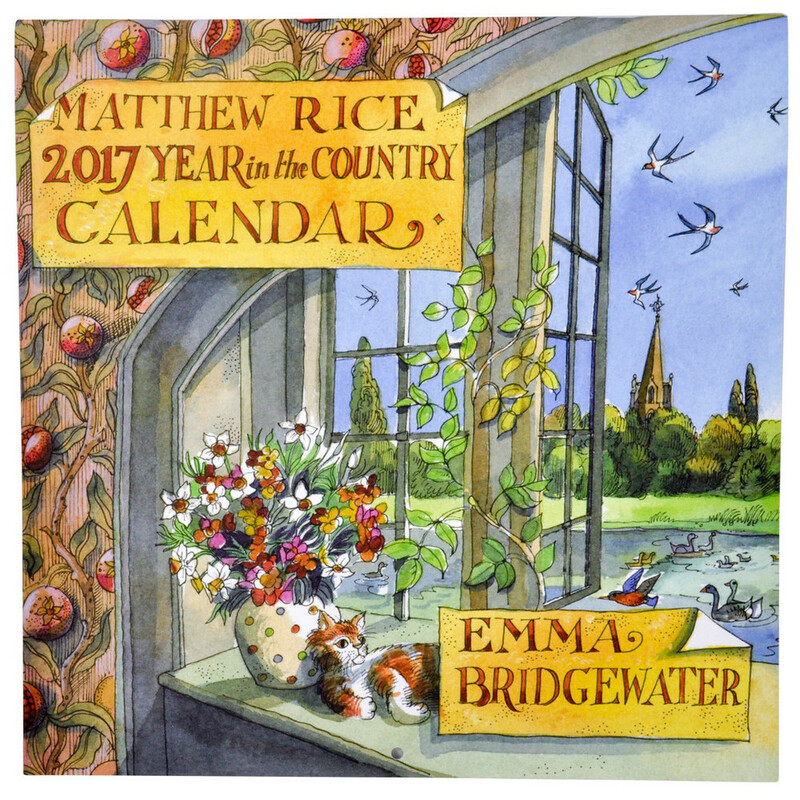 Matthew Rice “2017 Year in the Country Calendar” – Emma Bridgewater. This 2017 calendar is substantial, the colour of the illustrations is superb, and the intricate detail of Matthew’s animals, flowers and birds is just amazing. So, at a price of just £9.95 how can I resist yet again buying this for myself and my family. To have a closer look (and I can promise you some Pelicans, Egrets, Ibises and Herons for January), just click on this link to the Year in the Country 2017 Calendar. 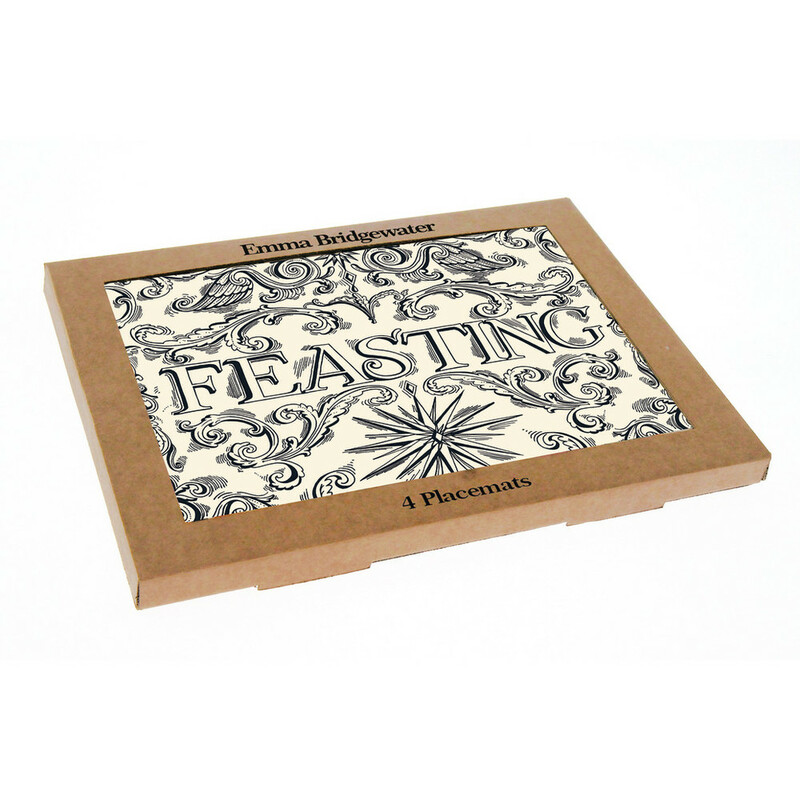 Another new item jumped out at me from the Emma Bridgewater site – fabulous heat resistant placemats in a pale cream with and exotic swirly pattern and script in a dark grey/black, with the word “Feasting’ across the middle of the mat. Very stylish, 29cm x 29cm (almost a foot square), and £35.00 for a set of four, with free delivery. To match these place mats there is a set of 4 coasters as well. Take a look below, or click on this next link to have a look at the full site. Another new pattern from Emma is Holly Wreath, and there are quite a few items, including a big tureen, plates, napkins, bowls, cups and saucers and mugs. But the one that caught my eye straight away was the Holly Wreath Mini Tureen. Very different colours, and a great shape. 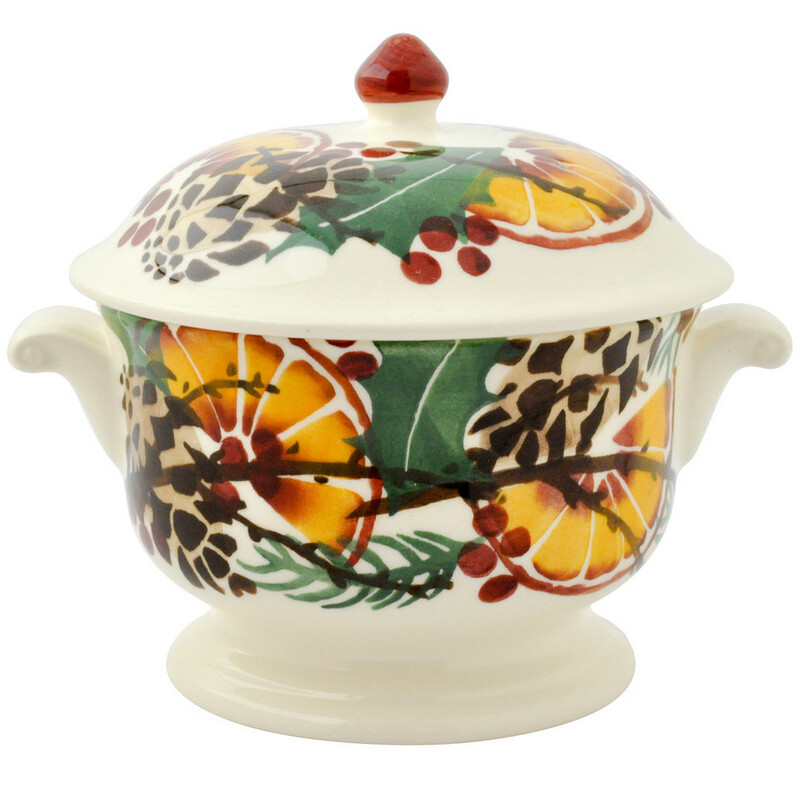 I love the richness of the colours in this Holly Wreath Mini Tureen – the rich dark green and the clementine orange. Very different from the usual Emma Bridgewater Christmas colours. And the shape of this Mini Tureen is very tactile – you feel that you almost want to stroke it! Or is that just me? The price is £34.95, and delivery is free. To have a look at all the Holly Wreath shapes (including the fabulous big Tureen), just click on this link. Well, it definitely is Christmas Present Time Again, so I need to go and order my calendars now, before they sell out. And just maybe take another look at the Holly Wreath cake plate, and serving bowl. They look quite special. Back soon.